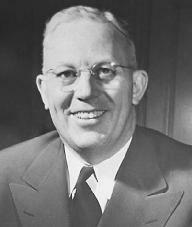 Earl Warren served as the fourteenth chief justice of the U.S. Supreme Court from 1953 to 1969. A former prosecutor, state attorney general, and governor of California, Warren previously had not served as a judge. In spite of his lack of judicial experience, Warren led a constitutional revolution that reshaped U.S. law and society and granted the lower federal courts wide latitude in enforcing individual constitutional rights. Although criticized by conservatives for his judicial activism, Warren has also been hailed as one of the greatest chief justices in U.S. history. Warren was born on March 19, 1891, in Los Angeles, California, but moved with his family to Bakersfield, California, as a young boy. The son of a railroad worker, Warren worked summers on railroad crews as a young man to earn money to attend college. He earned a bachelor's degree and a law degree from the University of California at Berkeley and was admitted to the California bar in 1914. After a brief period of service in the Army during World War I, Warren returned to northern California where he practiced law for a short time in San Francisco. Warren joined the Alameda County district attorney's office in 1920 and in 1925 was elected district attorney. Reelected two times, Warren established a reputation as a tough but fair prosecutor. A liberal Republican, he was elected California attorney general in 1938. Though he helped modernize the office during his term as attorney general, Warren's record was tarnished by his actions during the early months of U.S. involvement in World War II. In 1942 Warren was a key leader in demanding the removal of people of Japanese ancestry from the West Coast. At the time, Warren and others justified the removal of Japanese Americans on national security grounds, believing that California was vulnerable to Japanese spies and saboteurs. The U.S. Supreme Court, in kore-matsu v. united states, 323 U.S. 214, 65 S. Ct. 193, 89 L. Ed. 194 (1944), upheld the removal. Thousands of Japanese Americans lost their property and businesses and were "relocated" to concentration camps for the duration of the war. Warren defended his actions throughout his public career, but in retirement he admitted the relocation was a mistake based on hysteria and unsubstantiated fears. Warren was elected governor of California in 1942 and proved a popular political leader. He was reelected with Republican and Democratic Party support in 1946 and 1950. Warren's only political defeat came in 1948, when he was the Republican vice-presidential candidate on the ticket headed by thomas e. dewey that lost to President Harry S. Truman. In 1952 he played a key role in securing the Republican presidential nomination for dwight d. eisenhower, who in return promised Warren an appointment to the Supreme Court when a vacancy occurred. When Chief Justice fred m. vinson died unexpectedly in September 1953, Eisenhower appointed Warren as his successor. In his first term as chief justice, Warren confronted the issue of state-mandated racial Segregation in public schools. The case, which the Court had heard the previous year but was unable to decide, came back for reargument. In May 1954 Warren wrote the opinion for a unanimous Court in brown v. board of education, 347 U.S. 483, 74 S. Ct. 686, 98 L. Ed. 873 (1954). Brown overruled the 1896 Supreme Court decision of plessy v. ferguson, 163 U.S. 537, 16 S. Ct. 1138, 41 L. Ed. 256, which had allowed racially segregated facilities on trains and by implication in public schools. Writing that "separate educational facilities are inherently unequal," Warren held that racial segregation in Kansas denied African Americans Equal Protection of the laws. Brown unleashed a torrent of controversy and protest in the South and immediately established Warren's image as a liberal. Throughout the South, billboards appeared that read "Impeach Earl Warren." Nevertheless, in 1955 the Court ordered Kansas and other states with segregated schools to move with "all deliberate speed" to dismantle their dual school systems. The modern Civil Rights Movement was founded in this decision, which radically altered the traditional legal position on racial discrimination. When comprehensive federal Civil Rights legislation was enacted in the 1960s, the Warren Court easily upheld the Civil Rights Act of 1964 (42 U.S.C.A. § 2000a et seq.) and the Voting Rights Act of 1965 (42 U.S.C.A. § 1973 et seq.). The Warren Court was marked by its Strict Scrutiny of legislation that directly abridged the exercise of fundamental rights or narrowed the number of people who might exercise them, and of legislation that discriminated against various suspect classes. The strict scrutiny standard of review shifted to the government the burden of proving a compelling State Interest that could justify discriminatory legislation. On most occasions the government could not meet this burden. In addition, the Court "read into" the Fourteenth Amendment, applicable to the states, most of the provisions of the Bill of Rights, which until then had been applicable only to the federal government. Warren himself believed that his most important contribution to the law came in the area of legislative reapportionment. Most state legislatures had not apportioned their seats since the early 1900s. The allocation of seats was based on geographic areas and favored rural districts with small populations over growing urban and suburban areas. Political change was almost impossible because rural-dominated legislatures prevented reapportionment. Until the 1960s the Supreme Court had refused to intervene, concluding that cases challenging Apportionment were political questions beyond the Court's jurisdiction. In baker v. carr, 369 U.S. 186, 82 S. Ct. 691, 7 L. Ed. 2d 663 (1962), the Court held that it did have jurisdiction, and two years later, in reynolds v. sims, 377 U.S. 533, 84 S. Ct. 1362, 12 L. Ed. 2d 506 (1964), Warren wrote the opinion that has come to be known as the one person, one vote decision. Reynolds and a series of cases that followed forced state legislatures to be apportioned equally on the basis of population rather than geographic areas. Warren noted that "citizens, not history or economic interests cast votes," and that "legislators represent people, not acres or trees." Reapportionment based on population resulted in a shift of political power away from sparsely populated rural areas to metropolitan areas. Warren also reshaped U.S. Criminal Procedure, in the process drawing protest from law enforcement officials and those citizens who believed the Court was tipping the balance in favor of criminals. Many cases of this era limited police searches and seizures and the use of confessions and extended the Right to Counsel to poor persons accused of felonies. In gideon v. wainwright, 372 U.S. 335, 83 S. Ct. 792, 9 L. Ed. 2d 799 (1963), the Court held that the Sixth Amendment right to legal counsel encompassed state as well as federal criminal proceedings. Therefore, the state was required to appoint an attorney to represent an indigent person charged with a crime. In miranda v. arizona, 384 U.S. 436, 86 S. Ct. 1602, 16 L. Ed. 2d 694 (1966), the Court required what has come to be known as the Miranda warning: the police must inform arrested persons that they need not answer questions and that they may have an attorney present during questioning. Warren sought to ensure that suspects who are not sophisticated in law or who are not able to afford ready counsel are not disadvantaged. Nevertheless, rising crime convinced many citizens that the Court gave away too much of the government's authority in Miranda. The Warren Court also recognized the constitutional right of privacy in griswold v. connecticut, 381 U.S. 479, 85 S. Ct. 1678, 14 L. Ed. 2d 510 (1965). Griswold struck down a Connecticut statute that prohibited the dissemination of Birth Control information. In declaring the right of privacy, the Court laid the groundwork for the post–Warren Court decision in roe v. wade, 410 U.S. 113, 93 S. Ct. 705, 35 L. Ed. 2d 147 (1973), which gave women the right to have an Abortion. In 1963 President lyndon b. johnson persuaded Warren to head a commission investigating the assassination of President john f. kennedy. Warren reluctantly agreed to the request but was uncomfortable participating in this extrajudicial activity. The 1964 Warren Commission report has remained controversial. Critics have attacked its conclusions that Lee Harvey Oswald was the lone assassin and that there was no conspiracy to kill the president. "In civilized life, law floats in a sea of ethics. each is indispensable to civilization. Without law, we should be at the mercy of the least scrupulous; without ethics, law could not exist." Warren informed President Johnson in June 1968 of his intent to retire but left the date of his resignation open. When Republicans blocked Johnson's nomination of Justice Abe Fortas in the fall of 1968, Warren agreed to serve until the next president took office in 1969, leaving the bench in July 1969. President richard m. nixon appointed warren e. burger as Warren's successor.Many commentators have praised Warren's tenure as chief justice, but critics have charged that his judicial activism was outside the proper role of the Court and that many of the decisions were based on his personal values rather than the Constitution or other legal sources. Both Chief Justice Burger and his successor, Chief Justice william h. rehnquist, have eschewed Warren's approach, applying more conservative principles. Warren died on July 9, 1974, in Washington, D.C.
Cray, Ed. 1997. Chief Justice: A Biography of Earl Warren. New York: Simon & Schuster. Schwartz, Bernard, ed. 1996. The Warren Court: A Retrospective. New York: Oxford Univ. Press. Japanese American Evacuation Cases; Judicial Review; School Desegregation; Warren Court.